Girl's night! We all need them! Whether it's for the reason of getting out of the house, away from your routine, catching up with your friends, or venting about your week while indulging in chocolate and/or wine it's good for the soul. I tell my husband all the time how the occasional girl's night makes me a better wife and mother. Dinner, manicures and pedicures, yoga class, coffee shops, movies, shopping and those places where you can paint and drink wine are all great girl's night outings. 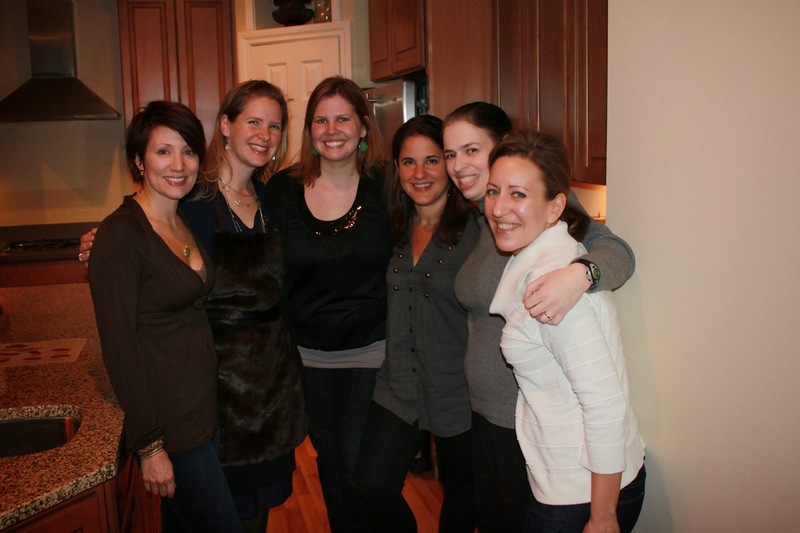 But if you are looking for a different idea, why not bring girl's night to your house and cook up something delicious. One day I got an email from one of our local grocery stores about a giveaway. The store was partnering with one of their food supply companies and giving away a food tasting party at your home. One of their food ambassadors (similar to a chef) would come to your home fully stocked with all the food, bake ware, and utensils to teach your guests how to prepare a few recipes and of course, sample them. I immediately signed up and really hoped to win as this would be the perfect girl's night. As luck would have it, I opened my email a couple weeks later to read that I had been selected to host a party! All I had to do was choose a date and invite the guests! Receiving this giveaway certainly made this girl's night an easy one for me to pull together, the opportunities are endless with this type of gathering. You could hire a chef, perhaps a student at a local culinary school or host and teach yourself. Maybe have a couple of friends each bring a recipe to make and share. Have your guests bring a fun apron to wear or make your own at the party. You could even make this a couples' night. Last year I went to a freezer meal party a friend hosted, there were seven girls total so we each pre-made six of the same freezer meals for everyone attending with cooking instructions attached. My first thought was wow, this is going to be a lot of work. But it was a lot of fun and definitely nice to bring home a week's worth of different meals! My party took place at the end of February. 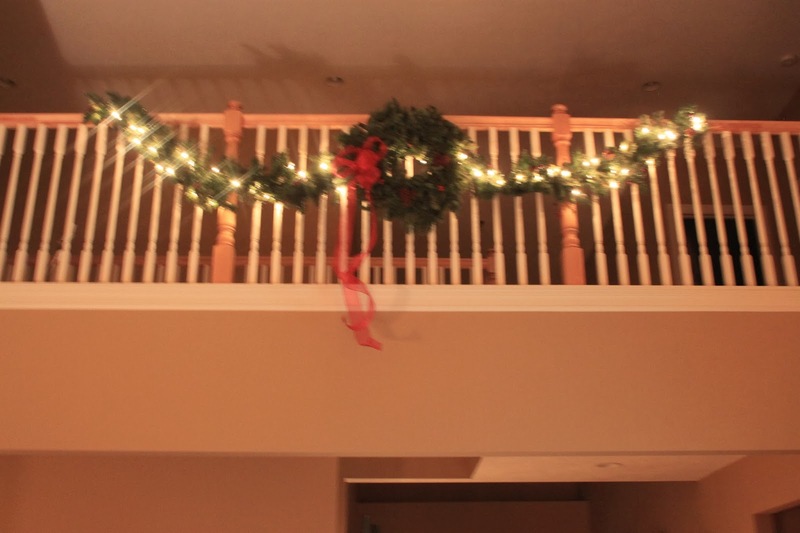 I was so over winter at that point and really enjoyed bringing out crisp, clean, white spring decorations. My floral arrangement of white and light green hydrangeas was a center piece along with white tulips from a local florist. I used a white quilt as a tablecloth, much cheaper than high end linen. 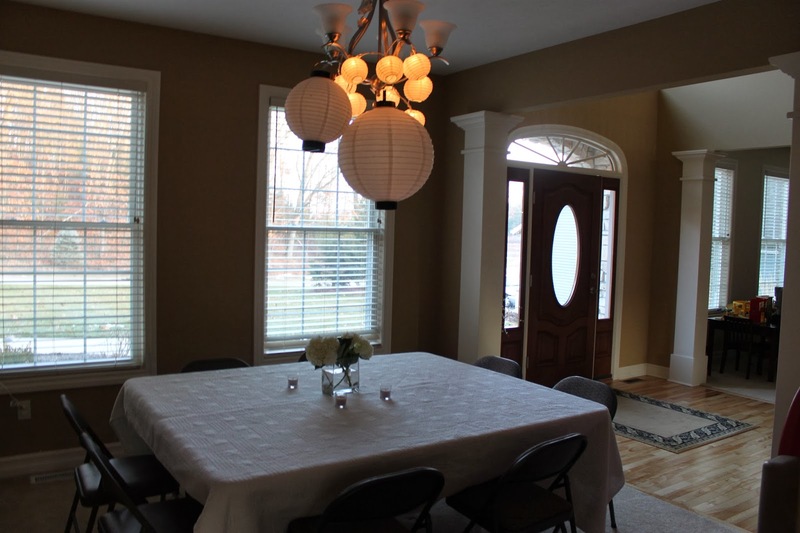 In the dining room I hung white lanterns over a temporary guest table and used white tea lights throughout the house. The appetizers were caprese bites (a basil leaf, mozzarella ball, and grape tomato on toothpicks then drizzled with balsamic vinegar) and multi-colored cooked tortellinis on a skewer with a pesto sauce. I also made a salad and put out some chocolate petit fours since I didn't know how much food the ambassador was preparing and didn't want anyone to leave hungry. For drinks we had plenty of wine, soft drinks, and pudding shots. These were fun and yummy! For the recipe I used click here, although instead of the Irish cream I used Kahlua and put a dollop of Cool Whip on top. I served them in cups made out of chocolate that I picked up from a local specialty food shop. I can't believe I didn't take a picture of these, but the chocolate cups looked just like this. However, the ones I found were not anywhere near that price! With drinks in hand and lots of chatting, we turned our attention to the food ambassador who gave a thorough explanation of the food and how to make the recipes. A couple of the girls got in there and chopped away, preparing the food, but a majority of us kicked back and just waited to sample everything. After everyone drank and ate, the food ambassador cleaned the kitchen while we finished catching up! 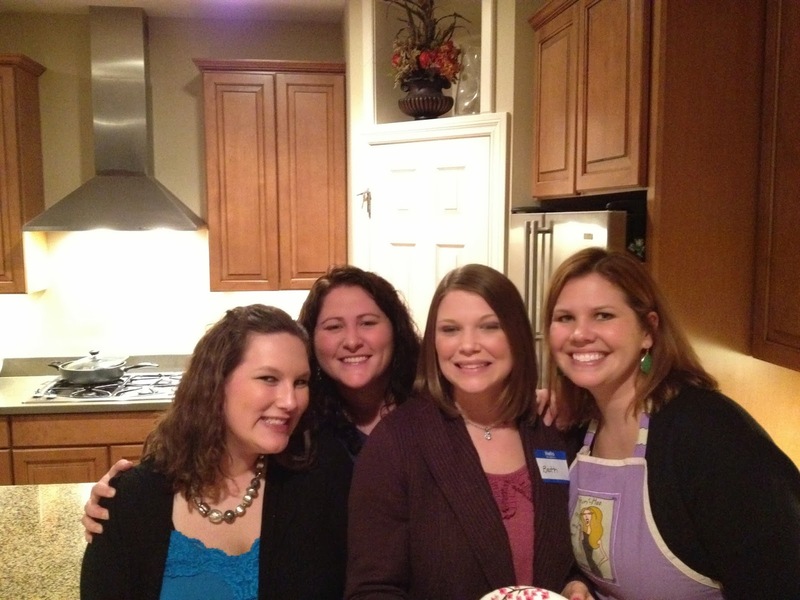 Everyone left that night with recipe cards of the food sampled and another fun, but relaxing girl's night on the books! One of my best friends gave me an angel with the saying "friends are angels following you through life." I couldn't agree more and can't imagine where I would be without my amazing friends by my side!! Friends for 20 years and counting!! Between my twin boys' need to learn their letters and not wanting to hear one more episode of Calliou's whiny voice I got an idea to incorporate a little learning while having fun. I found some intriguing and active letter learning exercises in Family Fun magazine last winter which gave me the idea to have the boys learn a letter a day, similar to what they were doing in pre-school. Hopefully this reinforcement would help them cement their knowledge of recognizing, writing, and learning the sounds of letters. After all, learning and parenting is all about consistency and repetition, right? The fun part of these days would be the outings, crafts, games, and food associated with the letter of the day. The learning part was the boys' identification of uppercase and lower case letters, practicing sounds, and tracing/writing the letters in mini lessons. And when I say mini lesson, I mean 10-15 minutes tops and the use of lined handwriting paper I found at Dollar Tree. As any mom of a toddler knows, three and four year old attention spans are short. The amount of time, energy, and money you put in is up to you. Some "letter days" we went on outings to the Air Zoo, downtown, or ice cream shop. Other days we simply played hide and seek and ate hot dogs. Also, we did not do this consecutively. My goal was two" letter days " per week. While I did well sticking to my goal, I do have to confess that we did not make it through the entire alphabet. Life gets busy. A holiday, trip out of town, and warm weather distracted me from this project. However, we did have a lot of fun doing this and I am proud to say the letters we did learn, the boys know very well! I also plan to do this with my girls when they are ready to learn their letters. On letter "A day", I started with showing the boys the uppercase and lowercase A. We practiced the sound and made a game out of who could come up with the most words that began with A. Then I had them each trace the letter and write a line of uppercase and lowercase As. 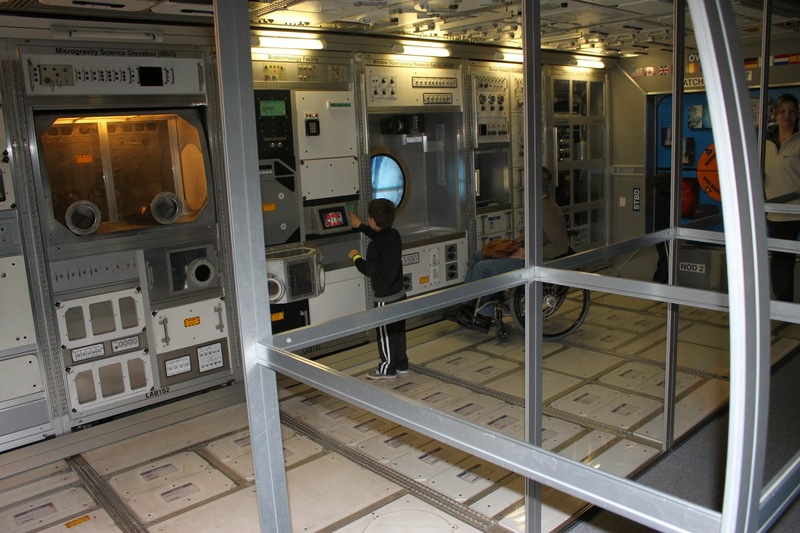 Once this part was finished I told them about our trip to the Air Zoo to see lots of airplanes and even an astronaut. I'm not sure who was more excited for this trip, my husband or the boys?! 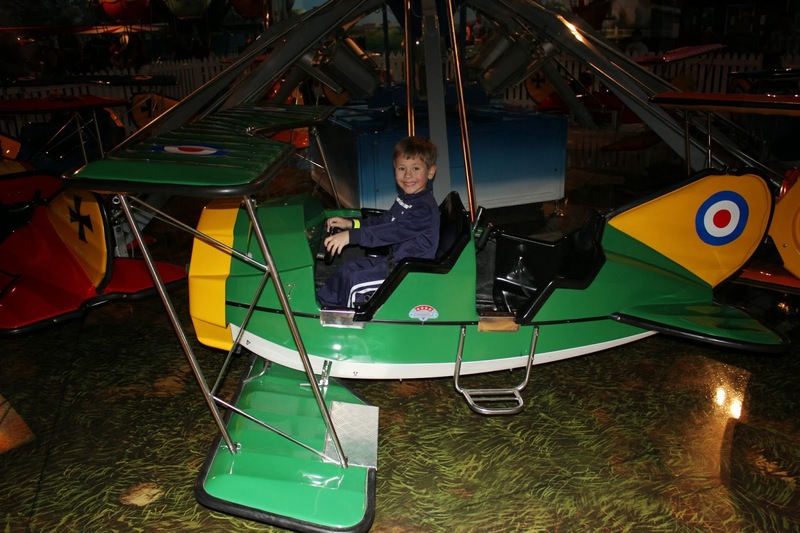 We were fortunate to have an amazing air zoo not too far away. 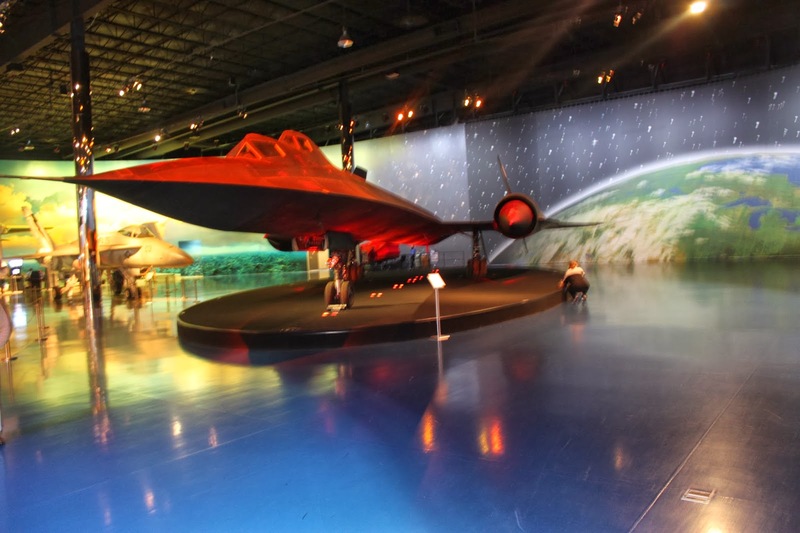 This place is full of real airplanes, a few rides (airplanes and hot air balloons that go in a circle), simulators of trips to space, and a large space exhibit where kids can sit in a pretend spaceship, watch real space shuttles take off on the screen, and take a 3-D space shuttle ride. You can't sit in this one, but it's fun to look at. 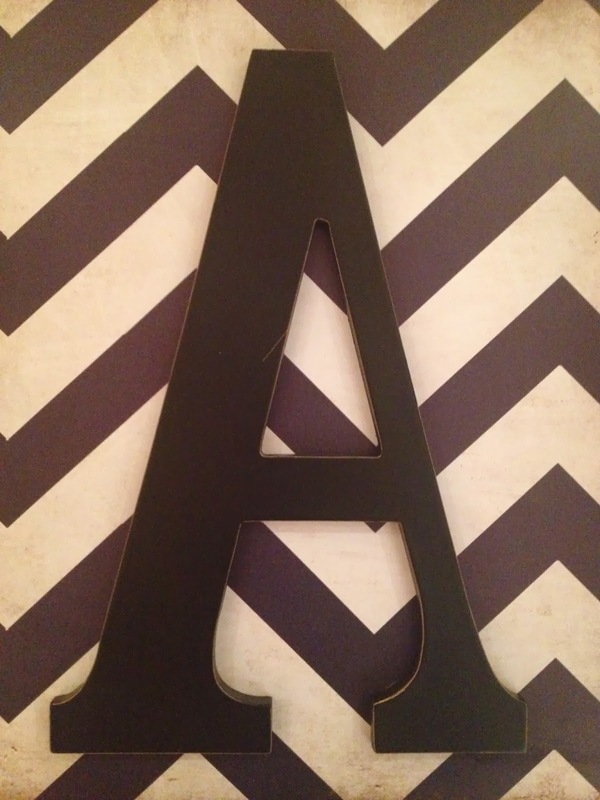 Throughout the day I had the boys find the letter A on various signs and tell me what sound it makes. For snacks, I packed apples and animal crackers. Since this adventure took a good part of the day we finished by reading our books on outer space and talking about astronauts. Again, you can do as much or as little as you want, incorporating activities into learning a letter a day. In the end, it was a fun way to sneak in a little learning. For "B day" we started off the same way. Bacon and bananas were included in breakfast and then we did our lesson on uppercase and lower case B. The boys then took a bubble bath, we blew up balloons and used them as targets for our Nerf guns. A visit from cousin B, making brownies (out of a box-lol!) and indoor bowling completed our "B" day. Again, "C day" began the same as the other days and included coloring, crafts with letter C (making a cat out of construction paper, pipe cleaners, googly eyes, feathers, glue, and glitter). We played cars, ate carrots, celery (ants on a log), cheese and crackers, and cantaloupe.We also watched Cat in the Hat and had caramel corn for a snack. 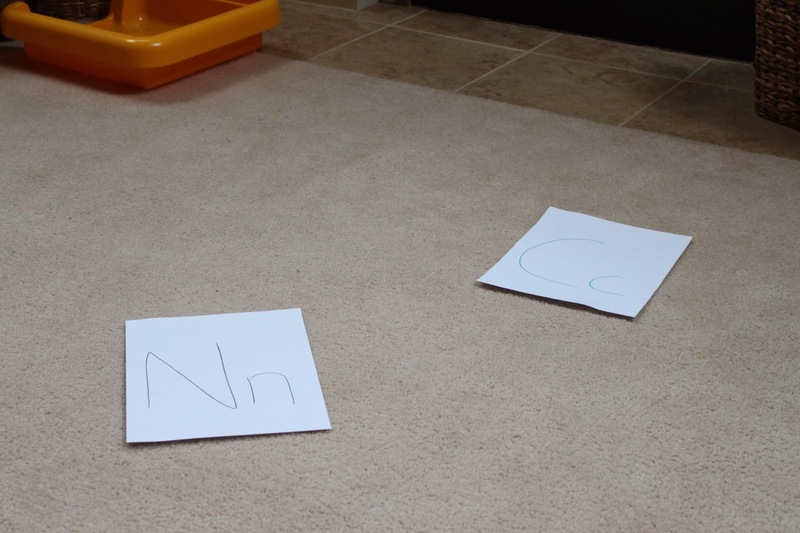 Once we learned three letters, I played an easy letter review game with the boys. I got this idea from Family Fun magazine. On a piece of paper I wrote the letters we learned (upper and lowercase), and threw in three or four other letters. I spread the pieces of paper out on the living room floor and whose ever turn it was had to find and jump on the letter I called out. If they got it right, I tossed them a Hershey Kiss. They had a lot of fun with this and requested to play often. Now that I'm thinking about it, I'm sure the chocolate had nothing to do with their love of this game!! Another great tool for learning and writing letters and numbers at home is the Letter School app from i-tunes. If you have an i-Pad or i-phone I highly recommend this $2.99 app. My kids love it. 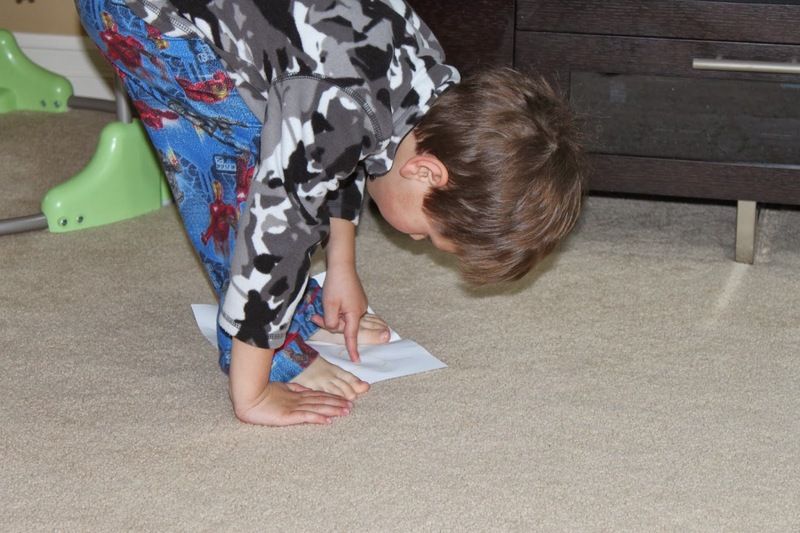 You can also print out free letter handwriting sheets from The Measured Mom by clicking here. 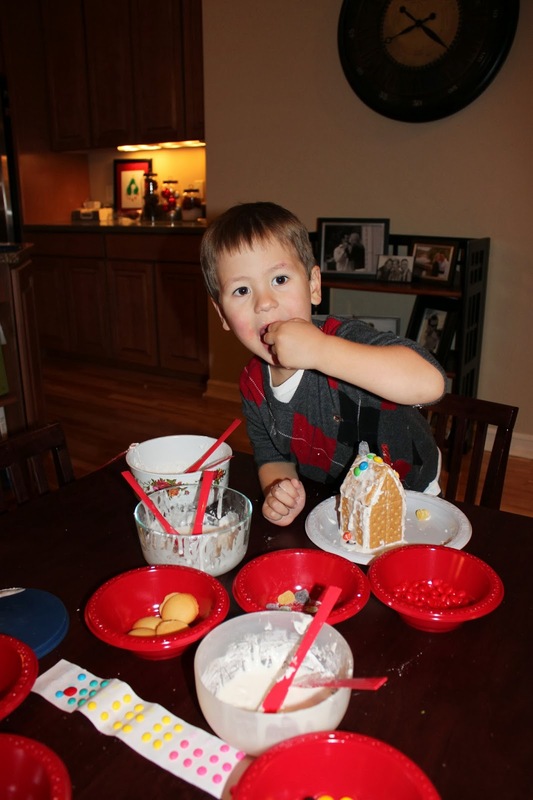 This blog is by a former teacher and has a lot of great learning activities you can do at home. With a love of putting on holiday parties, it was only right that we volunteer to host a couple of our neighborhood gatherings. Those years there were five or six other families with young kids, these days there are about two dozen kids on the street. What a party that would be! 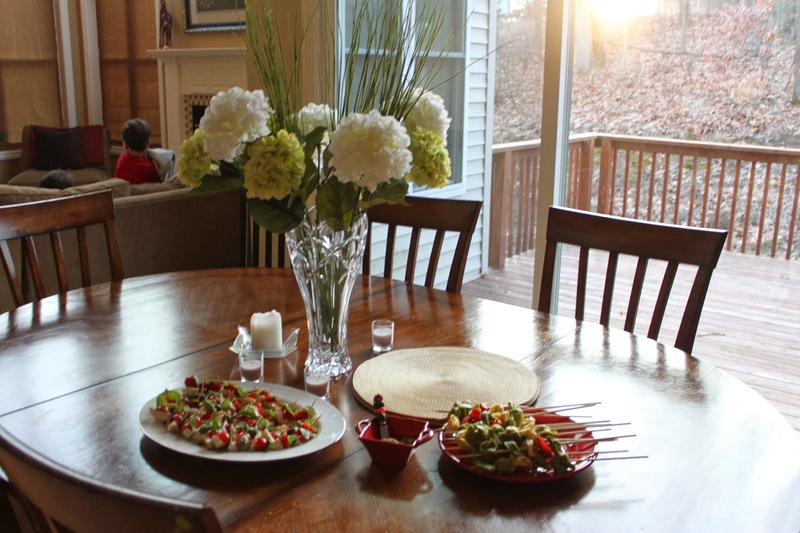 The first year, we found a day that worked for everyone to gather and we provided beverages, a couple appetizers, and dessert while asking our neighbors to bring a dish of their choosing. 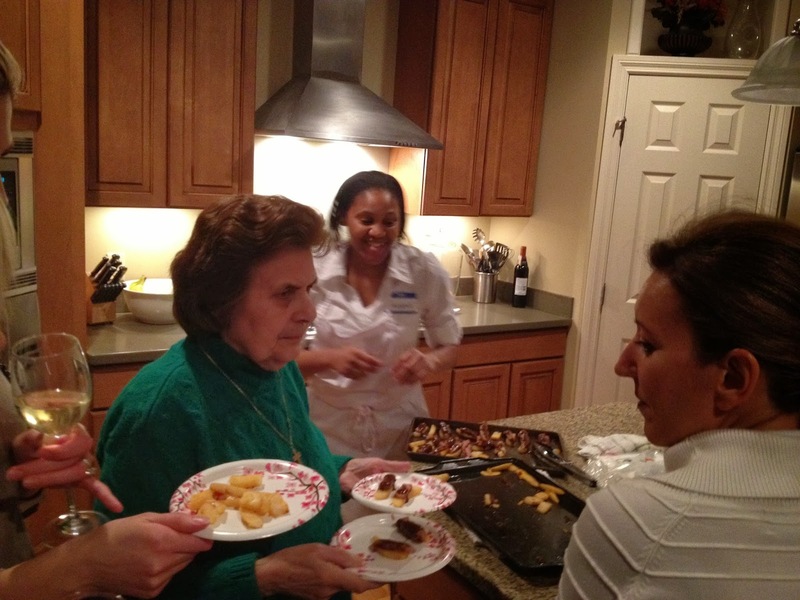 We ended up with a large and delicious spread of hot and cold appetizers, salads, pastas, casseroles, and desserts. 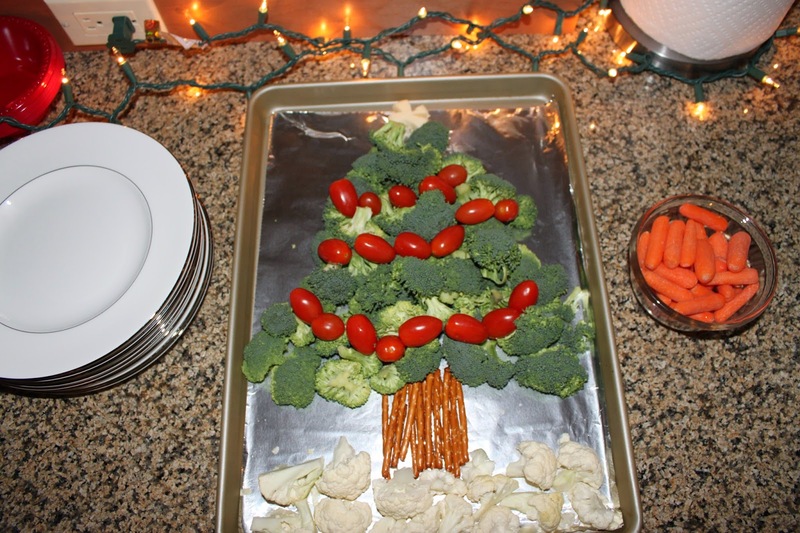 More recently, I also made a similar Christmas tree out of fruit, veggies, and different cheeses which was a big hit with the kids. 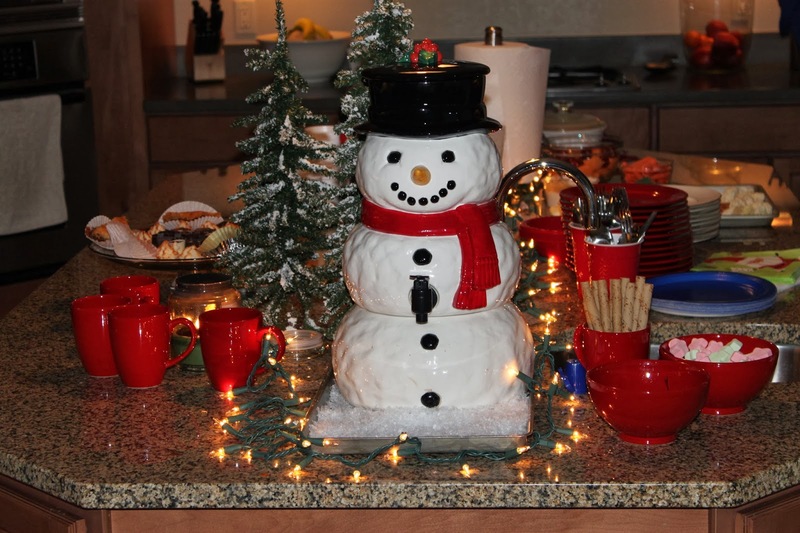 I had this snowman decanter sitting in a cupboard just screaming to be filled with a batch of homemade hot chocolate! I have made a couple different recipes for a large group and this one is by far the best- large batch hot chocolate recipe. From there I added an array of toppings including marshmallows, miniature candy canes, chocolate chips, chocolate Piroulines (long chocolate creme filled cookie sticks), and whip cream. I put the snowman on a cookie sheet to catch any spills and tossed on fake snow flakes I found at Target. I have learned that when you are hosting young children at your house for awhile it's a good idea to plan an activity or game to keep them busy. Plus, it's just fun to spend time with your kids making something together. 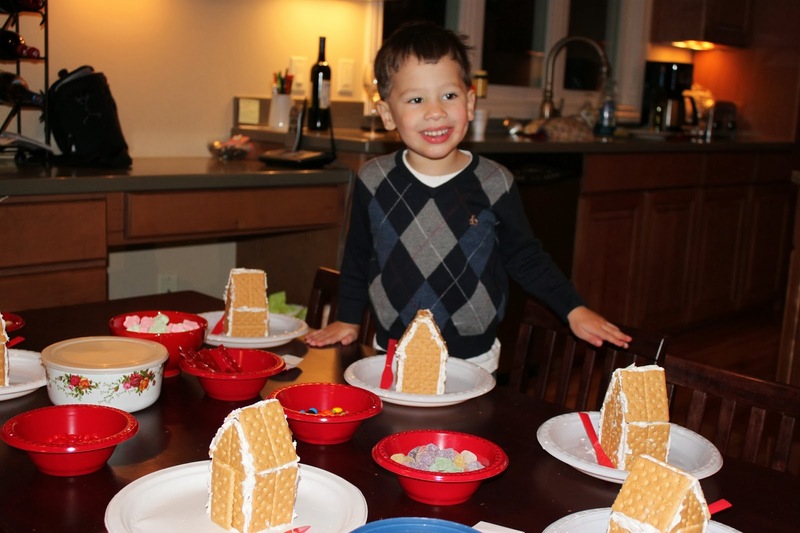 I immediately recalled Christmas time memories of my childhood and how much fun I had making and decorating graham cracker gingerbread houses. 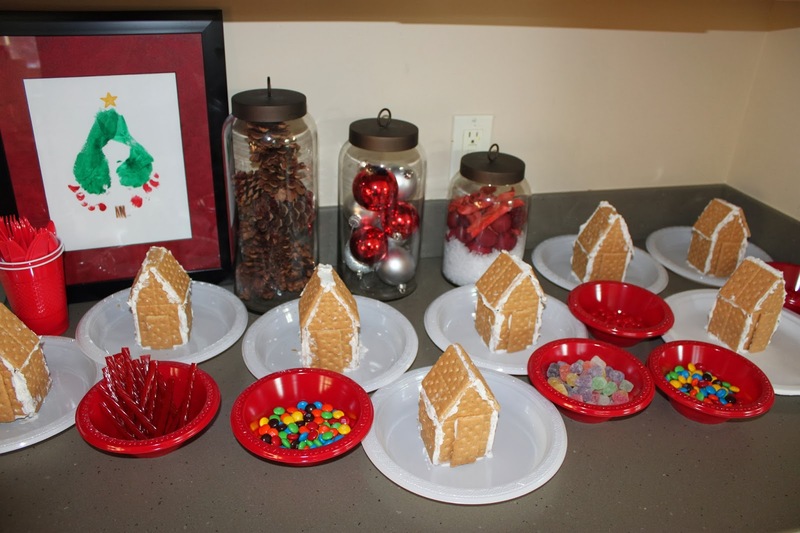 Since I knew there would only be six or seven kids old enough to participate in this I decided to make the houses ahead of time and let the kids do the fun part, decorating and nibbling on the decorations! I did made a couple extra houses just in case any of them broke. "one for the house, one for me!" 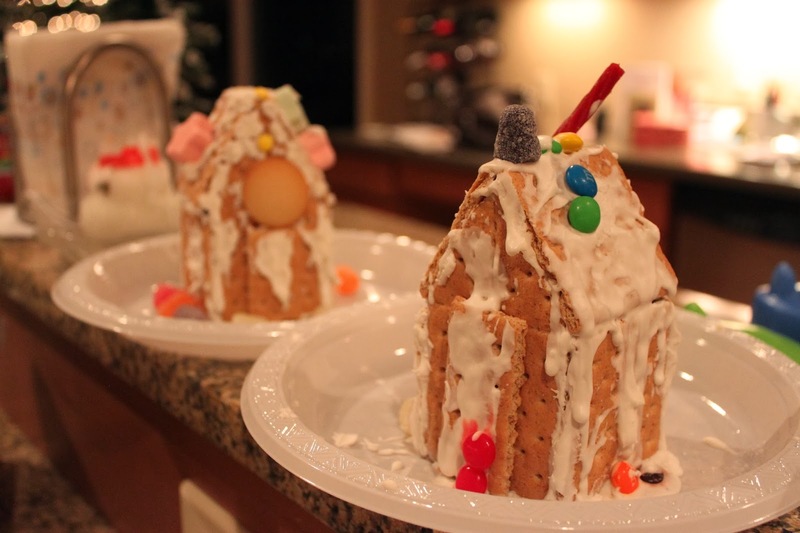 My boys' finished houses, I think they ate most of the decorations! A couple of the moms organized a gift exchange which we did next. 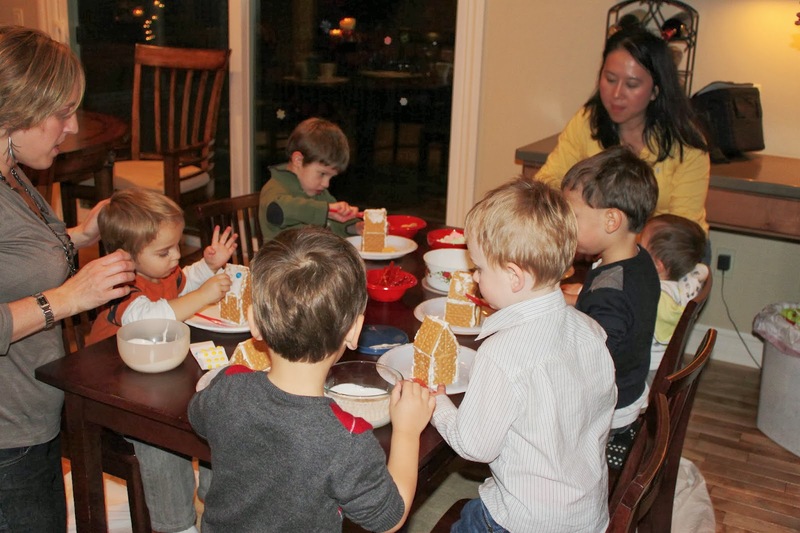 After a little playtime and a group picture our little guests departed with warm, full tummies and hands full of toys and gingerbread houses. We also hosted our neighborhood the following year with a similar plan except the amount of children significantly increased, including our own second set of infant twins. It was a bit more loud and hectic! 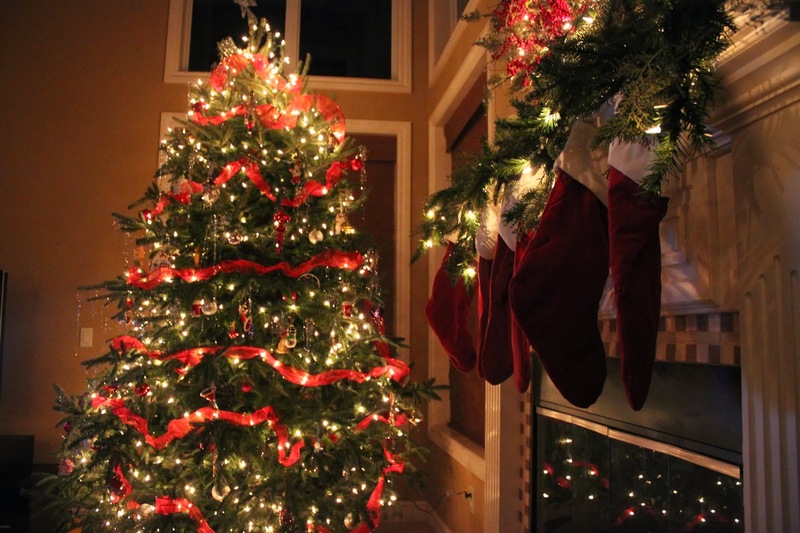 That year, I put out a variety of craft supplies for the kids to make into Christmas ornaments. 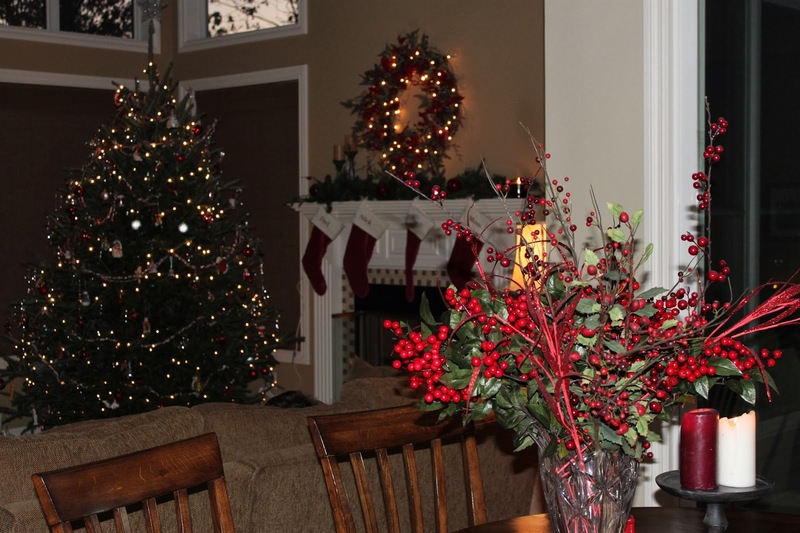 Even though we have since moved from the neighborhood, we will always have the wonderful memories of our multiple parties and good times with friends and family there. 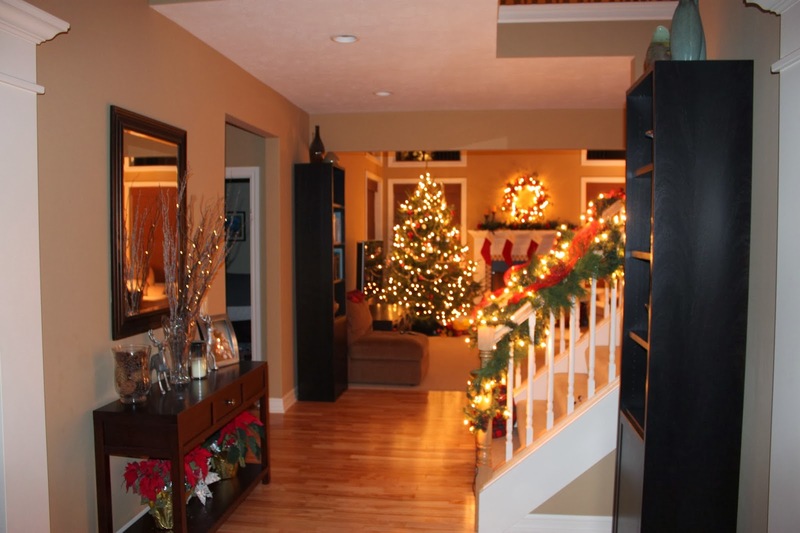 I absolutely loved decorating that house for the holidays. Below are a few pictures through the years. 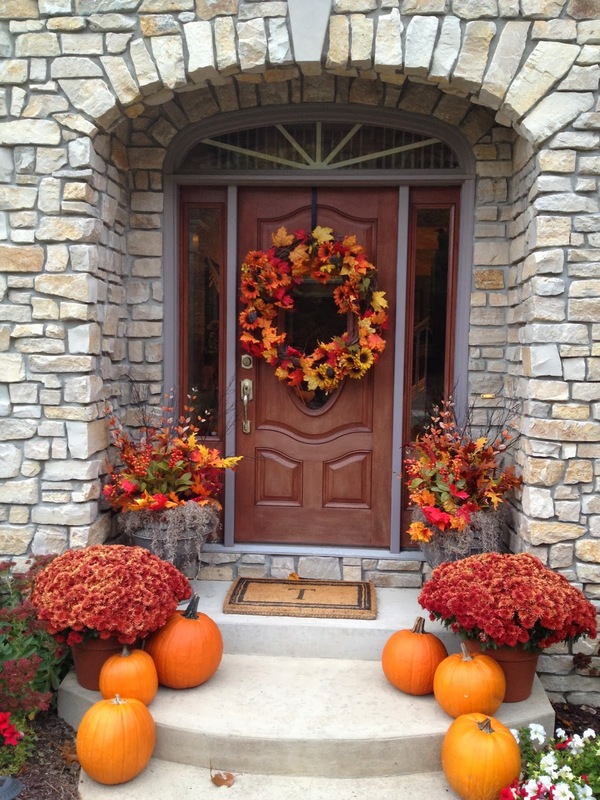 While summer is hands down my favorite season, fall is a VERY close second. Apples, fresh cider and doughnuts, pumpkins, warm days and cool nights, colorful leaves, a cozy fall wardrobe, football, and my very favorite: Halloween!! I love decorating the house for fall and it's an easy transition to the Halloween decorations which come out Oct. 1st of every year. 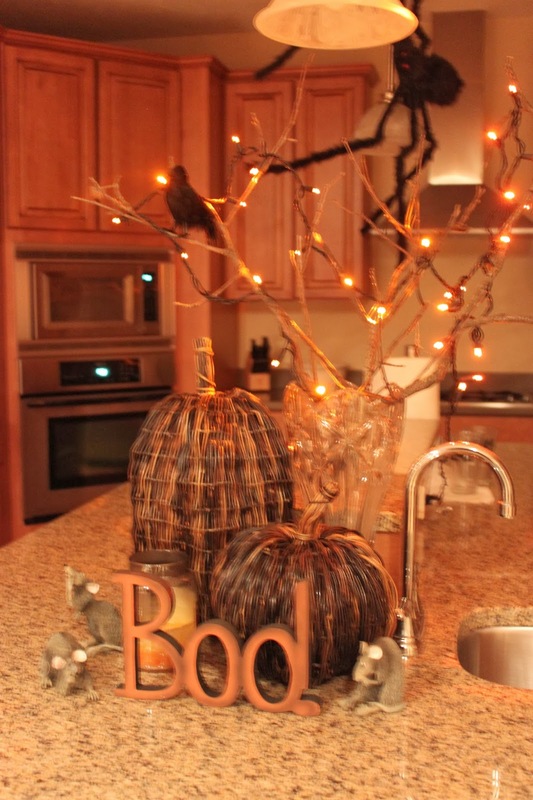 I leave up my fall decor and just add the spooky spiders, web, bats, mice, etc. to the mix. The extent of Halloween decor depends upon if we are hosting a party that year or not. 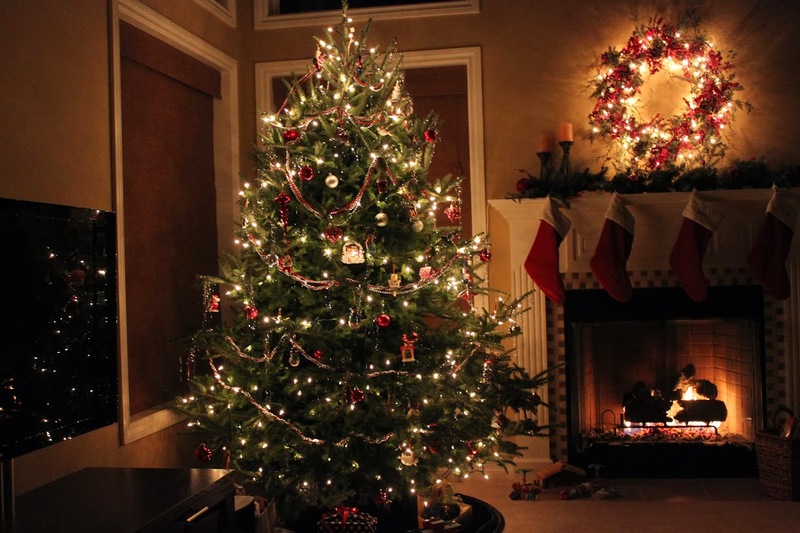 This year we were not, so I kept it simple. 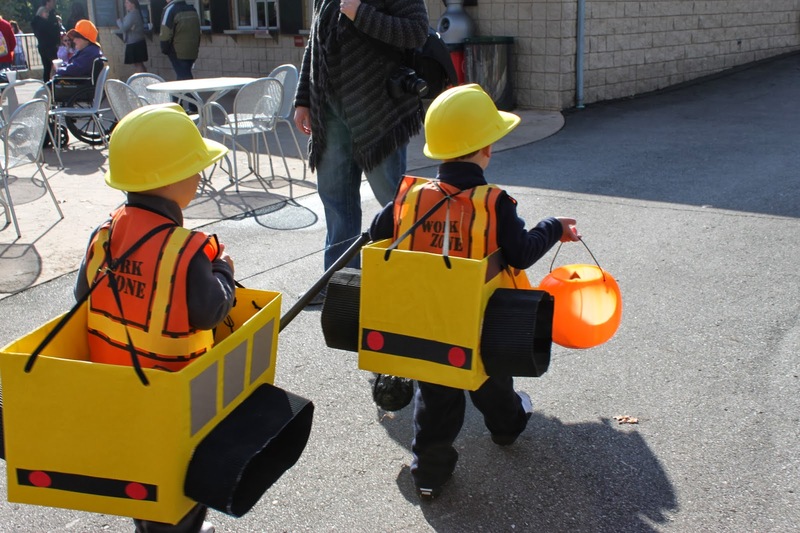 When I asked the boys that year what they wanted to be for Halloween they responded with "bulldozer" and "excavator." No lie! 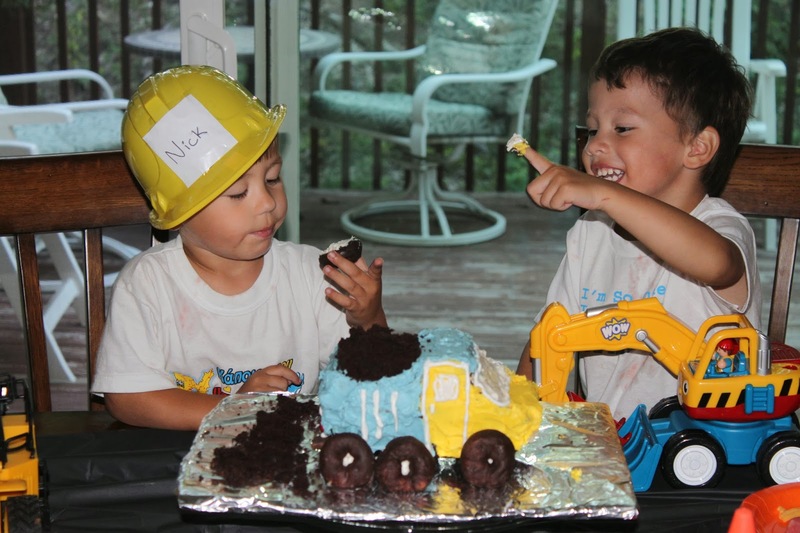 Hmmm...well we did have the construction hats and vests from their Birthday party. I began brainstorming and decided I could make small boxes worn around their waists into construction vehicles and all I had to do was add the straps and construction gear and we were good to go! 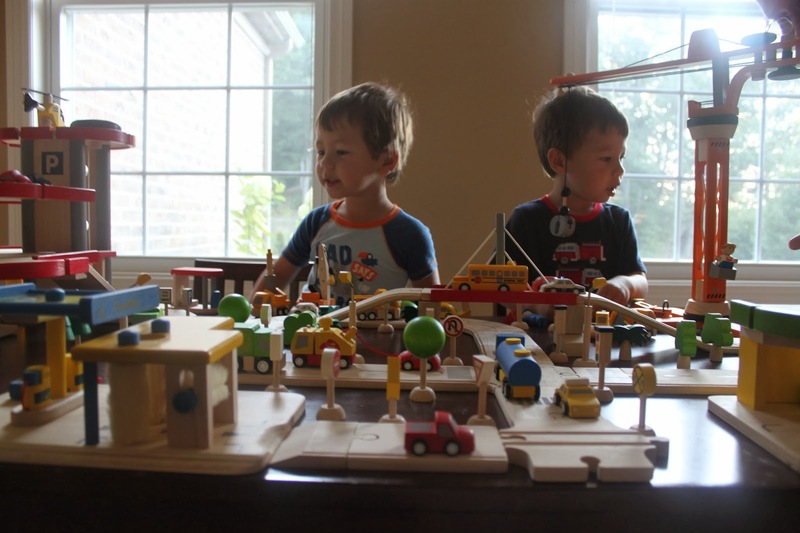 I found two boxes that fit around the boys perfectly and cut off the flaps so I had two square boxes with four connecting sides. Next I punched four small holes (two in the front of the box and two in the back) to string the black elastic straps through. I then covered the boxes entirely with yellow poster paper and poked the elastic string through the holes while knotting the ends securely to make the straps. I had the boys try them on but the straps were slipping off their shoulders. With the boys wearing them, I tied the front and back straps together with a twisty tie which did the trick. 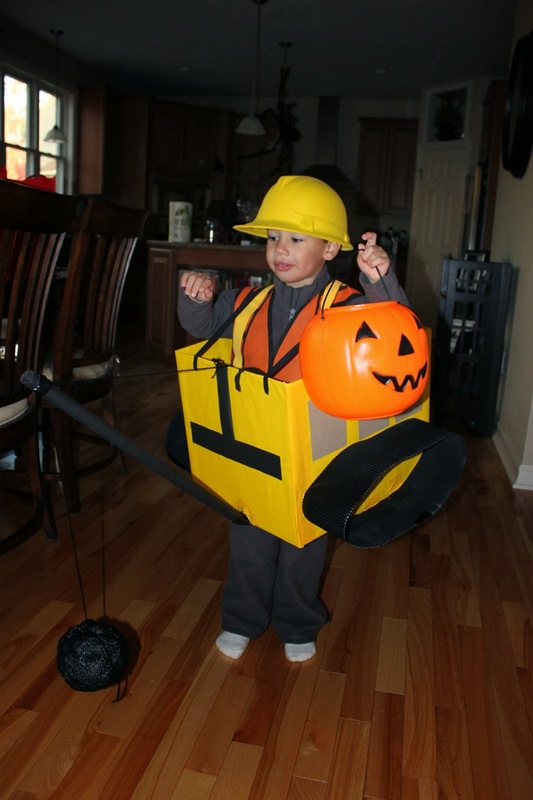 I knew I could make the bulldozer with cardboard but I was stumped on how to make a shovel for the digging arm. This is when I called in help from my mom. She came over with a box of supplies and in the end, we decided that a crane with a Styrofoam wrecking ball would be more feasible. 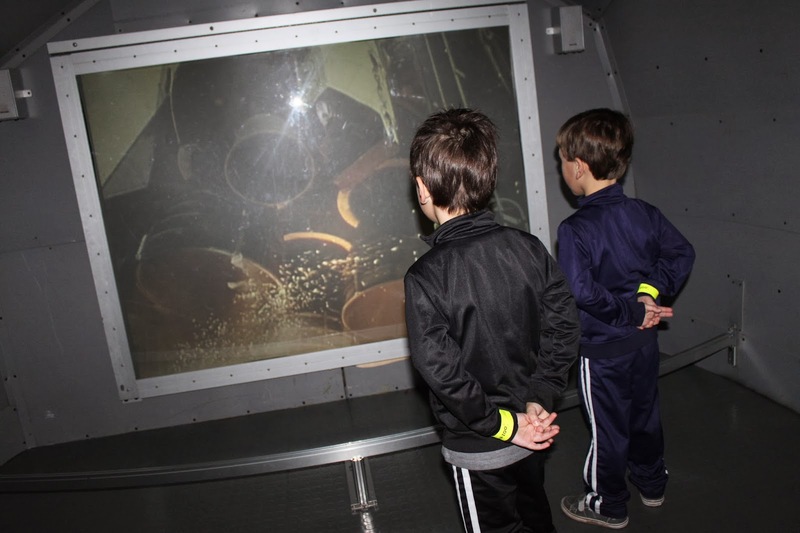 The crane itself consisted of multiple layers of black construction paper rolled up into a cylinder, black string, black electrical tape, and a Styrofoam ball spray painted black. The tracks were made out of black corrugated paper and fastened on with duct tape which was colored with marker to blend in. Lastly, I added the paper details. The blade of the bulldozer was made out of cardboard and brown paper, real sand and rocks were added to make it look more realistic. 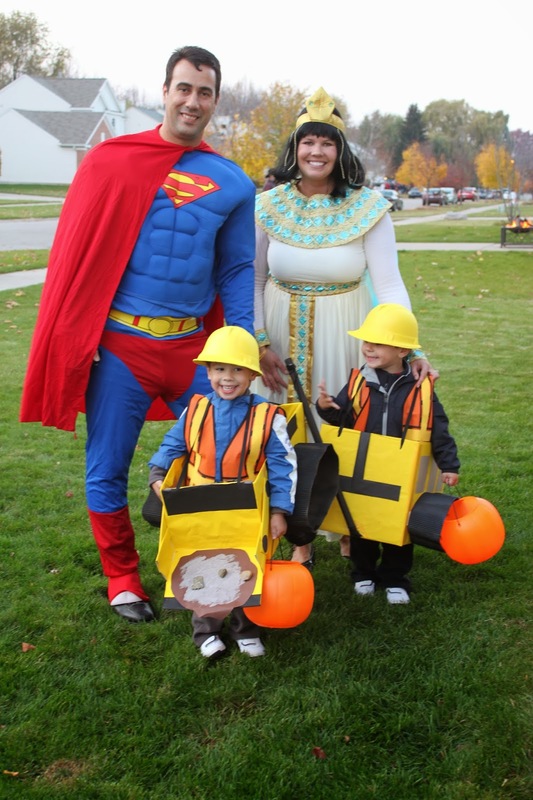 The results were a big hit at all three of the costume events we attended leading up to Halloween! 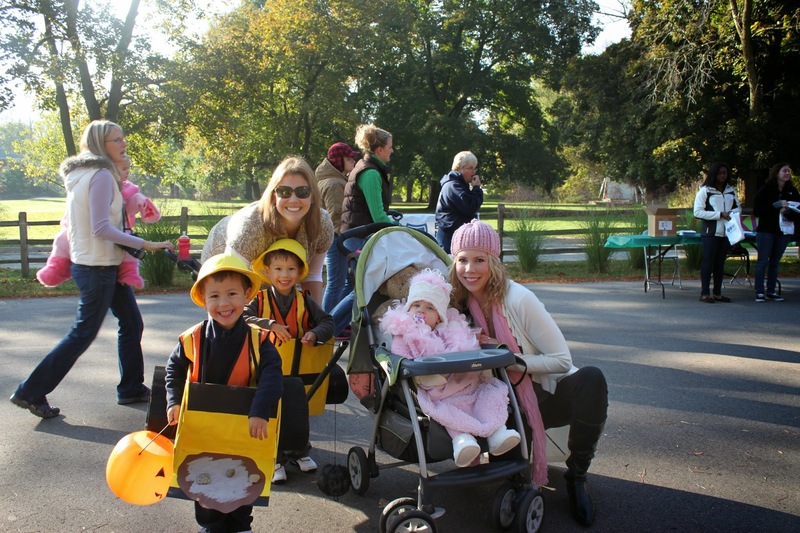 One of our traditions has been attending our zoo's annual Halloween party where there is trick or treating, face painting, arts and crafts, and special treats for the animals. 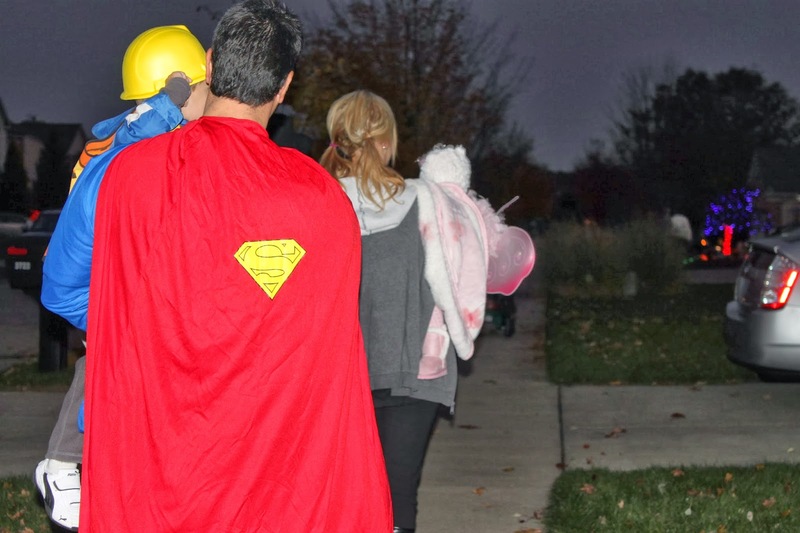 We have been doing this since the boys' second Halloween with a group of friends. During the month of October our family also gets together for my mom's annual adult Halloween party, we make a trip or two to the amazing apple orchard and bakery up the street, visit our favorite pumpkin patch to pick out pumpkins, and on Halloween we all gather at my sister's house for a delicious dinner and trick or treating in their neighborhood. 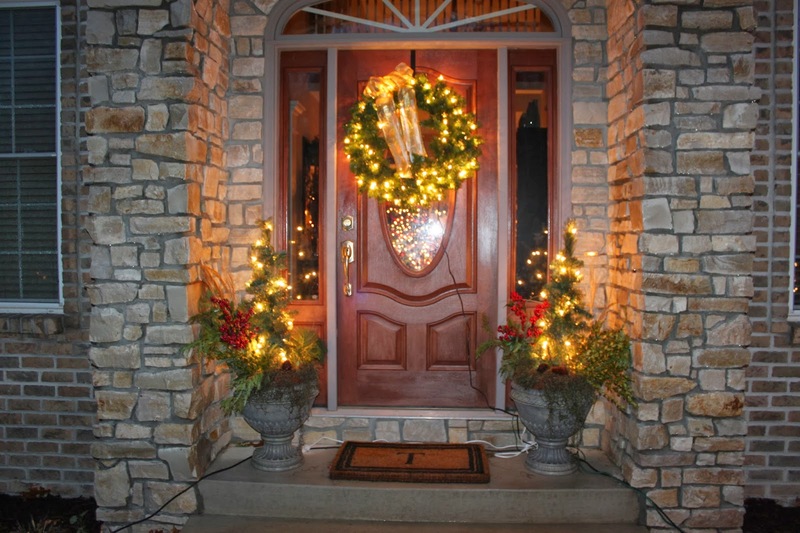 Many of the houses in her neighborhood are decked out in lights and decorations galore. It's always a fun night for the kids and adults. After a fun month celebrating all things fall and Halloween it's time to go home, get some rest, and start planning for our next adventure. 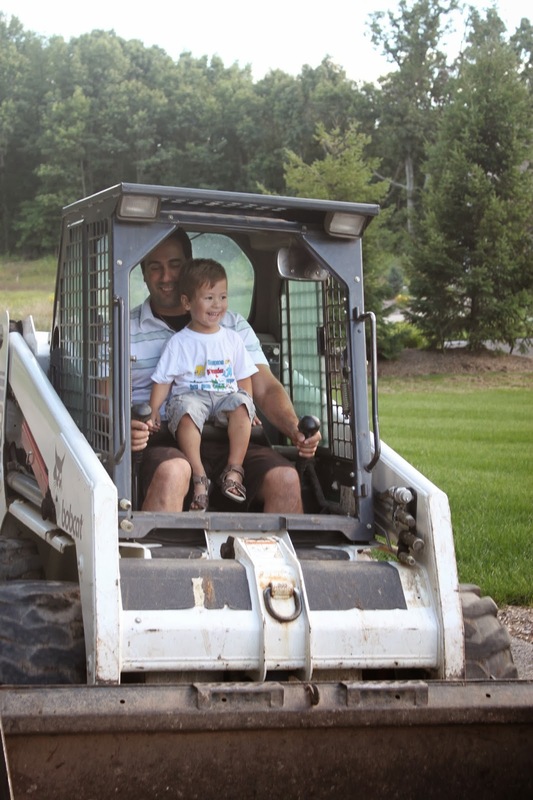 When my boys were two they loved cars, trucks, trains and airplanes, but those didn't measure up to the love they had for construction vehicles! When on the road little voices from the backseat would yell out, "Bobcat!" "backhoe loader!" "excavator!" They knew the names of every piece of construction equipment and schooled family members on what each machine did. So when it came time to plan their 3rd Birthday it was pretty easy to come up with the theme. We decided this Birthday party would be a family only event and was to take place the day after we celebrated their cousin's 1st Birthday since all three of them have the same birth date. Every year around this time we celebrate a weekend full of Birthday parties, one for the boys and one for their cousin. 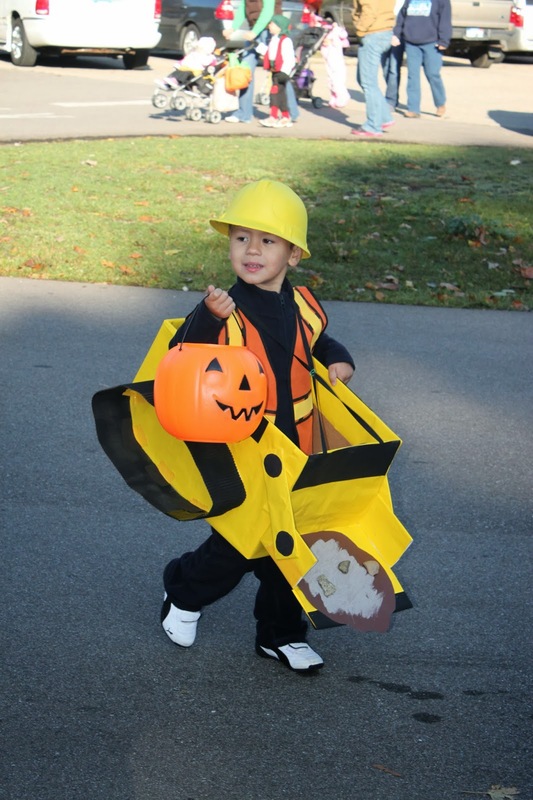 As I started party planning, I wasn't finding much in the stores or online for a construction theme other than Bob the Builder merchandise. I wasn't looking for a construction themed party pack, but something, anything, to give me inspiration and ideas to create my own party. This was 2011 so either Pinterest wasn't around yet, or I didn't know about it. 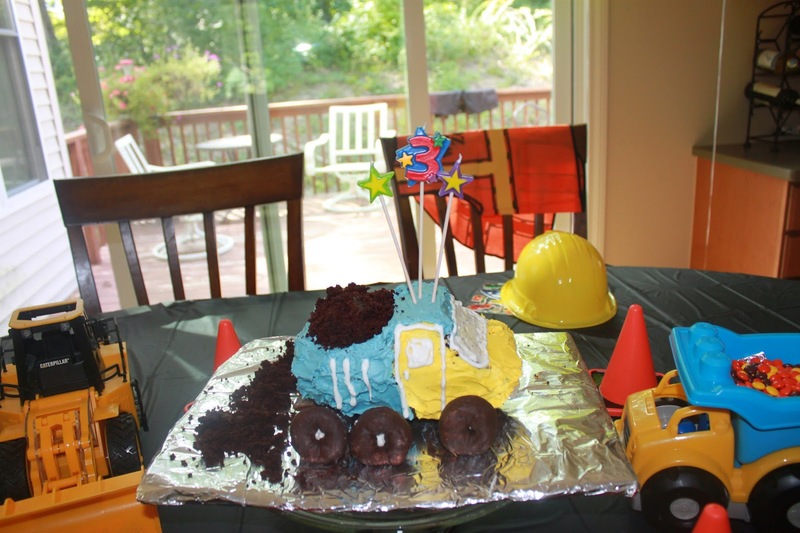 These days you could probably find a million construction themed party ideas (including the picture of the dump truck cake I made on Pinterest). 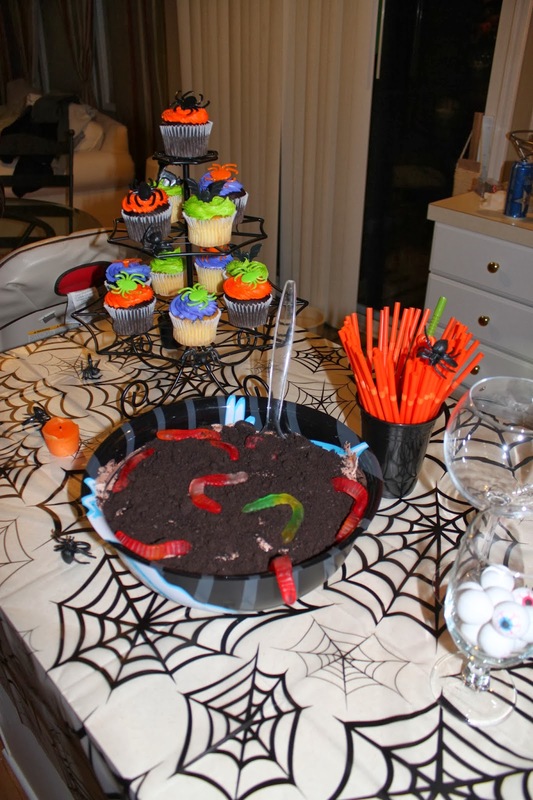 I decided to use a black plastic table cloth to resemble the road and from there I incorporated the boys construction vehicles for decorations and the washed up a toy dump truck as a candy dish for the appropriately construction colored Reeses Pieces. Online at Birthday Express I did find Caution tape and orange colored cones seen on the table as decorations. I decided to make the Happy Birthday banner myself and couldn't believe how easy it actually was. I went to Michael's Craft Store and picked out the heavy colored paper I wanted, black and white ribbon, and black stick on letters and numbers. From there I cut a large triangle and used that as a base for the rest, stuck on the letters, and stapled each flag to the ribbon. These are easy to make and way cuter than store bought ones. We also needed construction vests and hats, I found these at JoAnn Fabrics. I decided to personalize the hats for the boys and their cousin at the last minute. I wrote their names in marker and taped them on while adding a pink ribbon to their cousin's hat. If I had thought about this ahead of time I would have done a better job personalizing them by either writing the names onto the hats in permanent marker or printing the names out in a fun font on the computer using yellow paper to blend in with the hat. For appetizers we had veggies and dip and fruit kabobs. Homemade macaroni and cheese for the kids. Grilled jalapeno turkey burgers, corn on the cob, salad, baked beans, and potato salad for the adults. And for dessert, the dump truck cake and vanilla ice cream. The boys were amazed. I must admit it wasn't bad for my first effort at something besides a traditional round cake. I found the instructions to make the cake in the magazine Fun Food by Taste of Home. However, I decorated the cake differently using frosting instead of shoestring black licorice. I am writing the instructions according to how I decorated the cake. It's not that we aren't fans of black licorice, it's just that I'm not a fan of spending time on tons of tiny cake details! Again, another reason I don't bake often. 2. Bake at 350' for 25-30 minutes of until a toothpick inserted near center comes out clean. Cool for 10 minutes before removing pans to wire racks to cool completely. 3. Using a serrated knife, level the top of each cake. Crumble removed tops; set cakes and crumbs aside. 4. In a small bowl, cream shortening, butter and confectioners sugar until light and fluffy. Beat in milk and vanilla until smooth. 5. Place 1 cup frosting in a small bowl. Place 3/4 cup frosting in another bowl; tint blue. Place 1/4 cup frosting in a third bowl; leave plain. Frost top of one cake yellow; top with remaining cake to form truck body. 6. For truck cab, measure 2 in. from one end. Cut 1-3/4in. straight down; cut at an angle 1-1/2in. deep and 1 in. toward the front of the truck. Remove cake wedge and save for another use. For dump truck bed, leave 1-1/2 in. of cake for cab roof, then cut 1/2in. deep at an angle. Make a horizontal cut to the back of the truck. Remove cake wedge and save. 7. For wheel axles, place 2 snack cakes side by side and 1/2in. apart near one corner of an 11in. x 10in. covered board. Place the remaining snack cake parallel to and 2in. from the inside snack cake. Carefully arrange truck body over snack cakes. Frost the hood, doors and bottom third of the truck with yellow frosting. For wheels, attach doughnuts with plain frosting on each side of truck. 8. Spread some of white frosting on the slanted window shield. Place the remaining white frosting in a pastry or plastic bag. Cut a small hole in corner. Pipe the windows on the doors, front grille, and side of dump truck bed. Frost the rest of the dump truck blue. 9. For headlights, cut gumdrops in half. Place rounded half of each on outside of grill; discard the remaining cut gumdrops. 10. Place M&M's on back of bed for rear lights. For back bumper, break candy bar into individual sections at perforations. Cut one piece in half widthwise. Place some of the chocolate, flat side out, on the truck back. Spoon reserved crumbled cake into the truck bed for dirt. 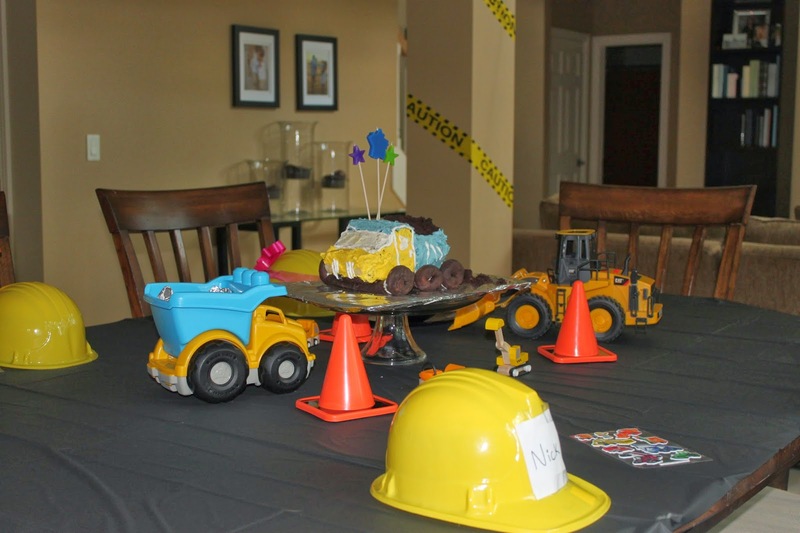 And what would a construction themed Birthday party be without an actual piece of construction equipment?! 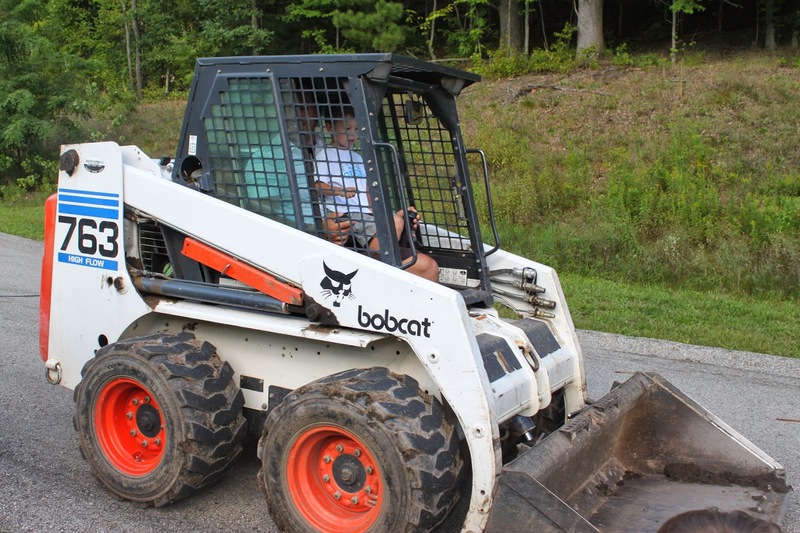 I put the word out among friends and acquaintances that I was looking to rent a loader or bobcat for about an hour and yes, it was for the sole purpose of bringing the biggest smiles to my little Birthday boys faces. I got a couple leads but unfortunately nothing worked out. I then called a couple rental companies and quickly realized there was no way I would pay what they were asking to rent a piece of equipment for the weekend. I was crushed, I really wanted to surprise them with this. Then one night on my way home from the grocery store I spotted a bobcat in the backyard of a house right around the corner from my house! 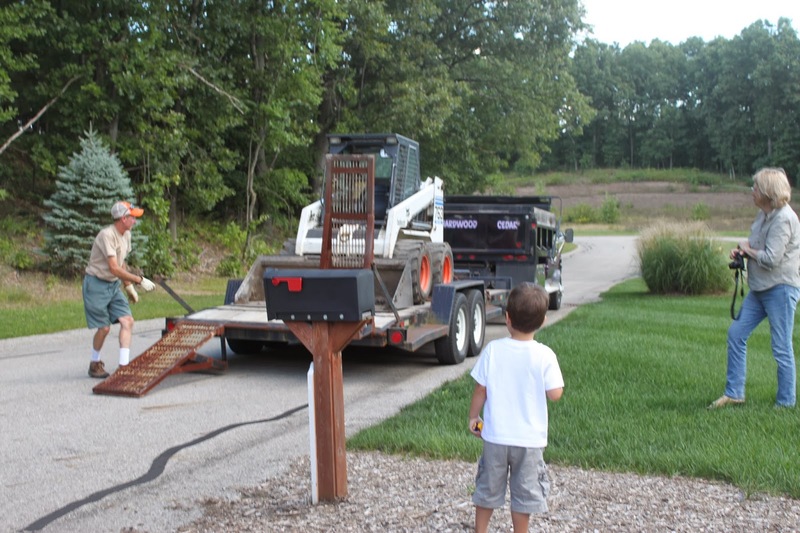 So doing what any half crazy, party planning, proud momma of construction vehicle loving boys does, I walked right up to the house and rang the doorbell. Thankfully a sweet, soft spoken man came to the door and after hearing my speech about wanting to rent a bobcat for my 3 year old boys to sit in and ride for an hour, he didn't look at me like I had eight heads but instead said he was a father and understood! I got his card and later called him with the details. I love when things work out like this!! Mr. Bob, the nicest bobcat owner around! And you can't see their faces in the picture but they were standing there, mouths dropped and speechless. Look at that smile! My husband got to drive the bobcat around our street. 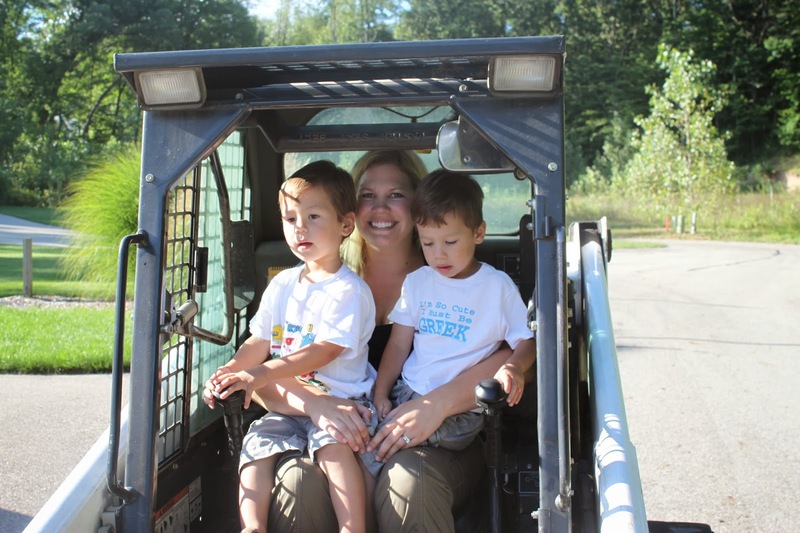 After the boys got over their initial shock of all this, we explored the bobcat, went on a couple rides, and the boys even got to push the button that raises and lowers the dump truck bed (that might have been as exciting as riding in the bobcat for them!). It was time to thank Mr. Bob again and say goodbye so we could go inside for cake and and presents. It was a great day and fun party, but it didn't end there. 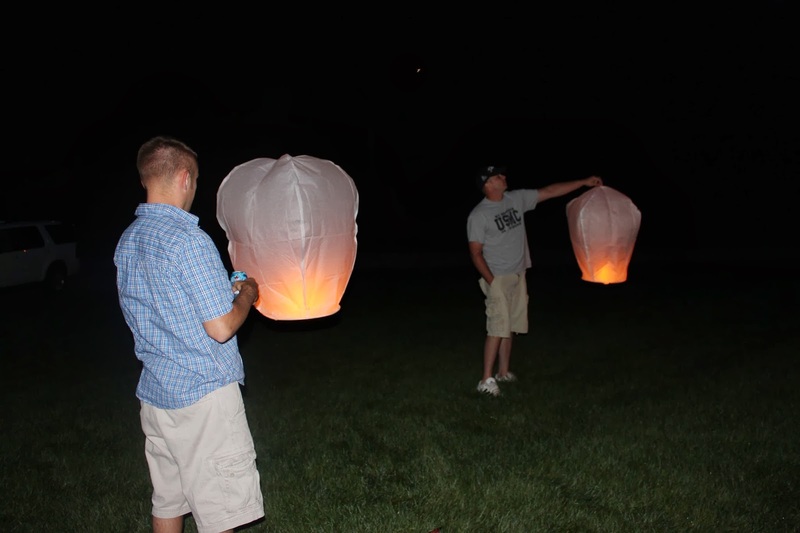 This was the year we started our family tradition of setting off Chinese wish lanterns in honor of the Birthday kids. 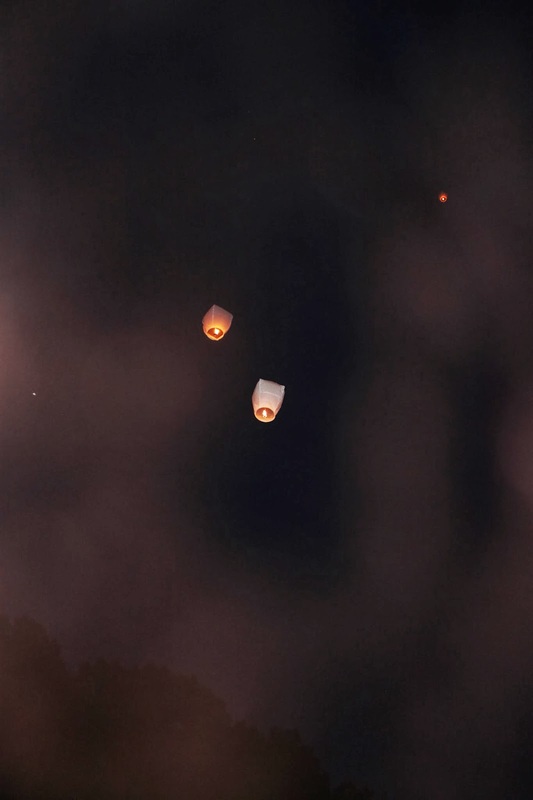 Each family (my parents, us, and my sisters and their families) wrote a wish on their lantern, lit them and sent them flying. They were fun to watch and we did make sure we weren't going through a dry spell before doing this. Another tradition we began that year was filling the Birthday kids' room with balloons the night before their Birthday while they are sleeping. 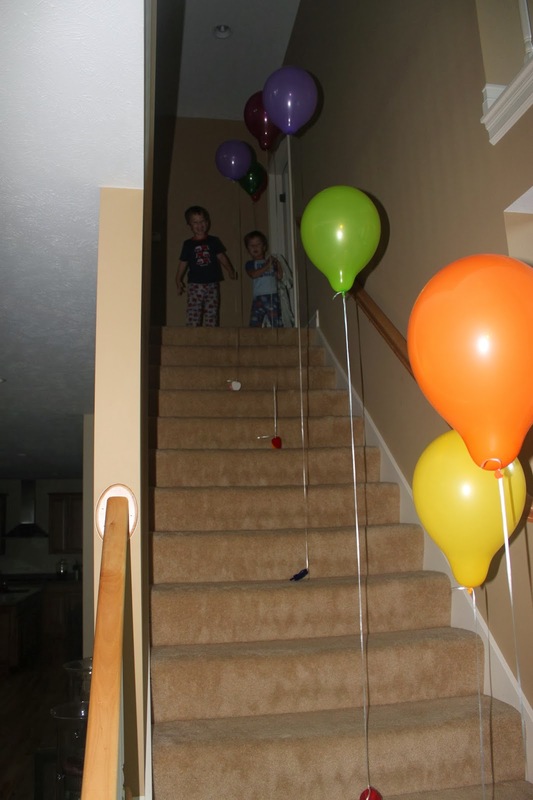 That year we also had a trail of balloons from their room to the playroom where grandma and grandpa were waiting to surprise them with their gift. It was a day that we will never forget, and even though the boys just turned three, they still remember their 3rd Birthday well. While some may think I went overboard on this party, I would agree with you if it wasn't for the fact that we happened to stumble upon a very nice man who gave us an extremely reasonable price to "play" in his Bobcat. The decorations cost less than $25 and the time I spent blowing up balloons and making a dump truck cake? Well that was worth every minute when I saw the smiles shining on their little faces and an afternoon and evening spent with them and our family making memories that will last a life time. Our carnival staff aprons complete with squirting flower! Late February I was sitting in our playroom watching my twin boys play cars together and flipping through the latest Oriental Trading catalog. 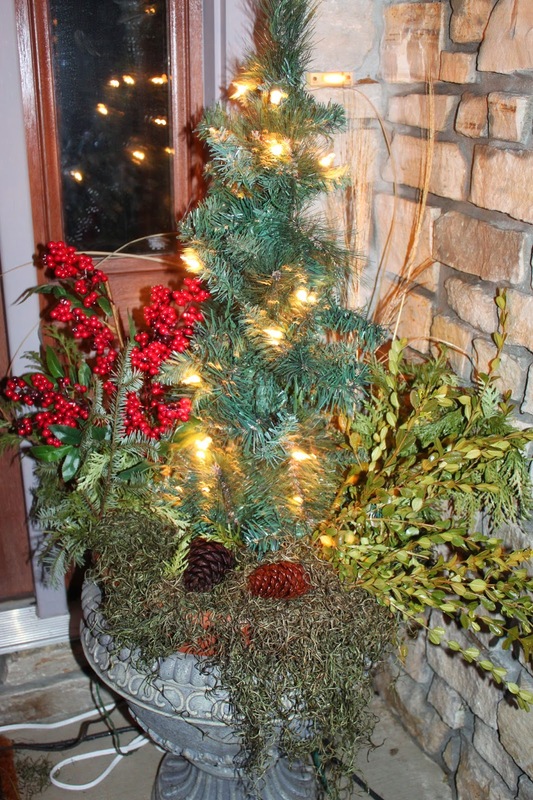 The days of being cooped up inside due to the cold winter were getting to me and I needed a project, or better yet, a party to plan! As I skimmed the two page section on carnival themed goodies, visions of sunny weather, red and white stripes, and our huge front yard filled with our friends playing homemade carnival games danced in my head! In my new found excitement I grabbed the phone and called my mom (aka my party advisor and helper) to tell her my idea and see what she thought since I knew this kind of event would need her expertise. She loved it and the ideas were bouncing back and forth right there on the spot. We finally ended the conversation with a date for sometime in July and a mental list of games and ideas. Since this was a carnival, we needed prizes so we planned the guest list very early. It consisted of the friends and neighbors that our kids liked to played with, 17 total. We could have created some amazing invitations for this event. However, I chose to put the energy into the event itself so I invited everyone personally a couple months before the date. I followed up with emails until right before the event. After many months of planning, drawing, constructing, and transporting, the day was finally here, it was time for the Carnival!!! The festivities began at 5pm and we welcomed everyone with a personalized bag to hold all their prizes, a welcome program that described the games, and a roll of tickets. Family and friends, including my mom and I were assigned a booth to run. 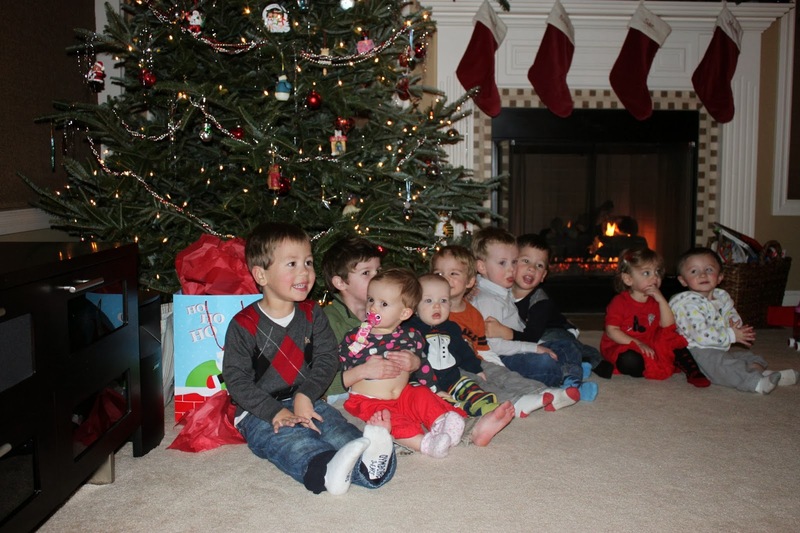 Since we would all be "working," my boys and baby niece got to play all the games first and collect their prizes with mom, dad, aunts, uncles, and grandma and grandpa cheering them on and snapping pictures like paparazzi! My boys LOVED it! Then when their friends arrived they had a blast bouncing around socializing and playing the games again. Monkey Smackdown! Throw the plastic bananas and knock the cans down. Hungry? Grab a bag of popcorn at the popcorn booth! I may be biased, but these are just too cute! Take your tickets to the prize booth and redeem them for a prize! There was also a Duck Pond, Goldfish Splash, Tattoo Booth, You're So Pretty- for girls only!, Go Fishing, and Guess How Many Jar! We had a bounce house set up for the kids too. At each booth, you turned in a yellow ticket, played the game, and then were given a blue ticket which you needed to redeem at the prize booth. We had designated prizes for each game and some extra prizes the kids could pick out too. We didn't want any unhappy customers at our carnival! For instance, the boys who played Alien Invasion won a light up space gun (yes, I did check with all the moms first if they were okay with the space guns since the oldest at the time was about 5 years old). When you played ring the ducks at the Duck Pond you won a little rubber ducky and if you threw the goldfish into the fishbowl at Goldfish Splash you won a bubble wand. All very cute prizes, but also prizes that didn't break the budget either. The Dollar Store and Oriental Trading are great places for carnival prizes. Some of the games like Go Fishing, you took your wooden fishing pole with fake worm and had to fish for your prize, an inflatable fish. He even had his own homemade apron! For dessert, you had to spin it to win it! Family members and I each made a dozen of a couple desserts that we used for this. After everyone ate and relaxed for a bit it was time for our last couple games. The cookie walk was first. I drew numbers on the driveway in chalk and had everyone start out on a number. When the music started you walked from number to number until the music stopped. Once the music stopped I drew a number from the basket and whose ever number was called won a giant homemade chocolate chip cookie! We did ten rounds of this. Next, it was time for the egg and spoon race. My mom found plastic spoons and eggs that release a bean bag yolk when dropped. A child and parent were matched up and they had to carry the egg on the spoon halfway down the driveway to the finish line. Once you made it, you were showered in confetti and given a circus striped lollipop! The confetti was such a hit we had some repeat players! After the last game, the sun was starting to set and either the kids were high on sugar or exhausted so many families said their goodbyes. However, my husband turned up with a bucket full of water balloons and a fight commenced! What a rousing end to a day of family fun. This carnival was almost six months in the making, and worth all the time, energy, and money in my opinion. The kids (and quite frankly the adults) faces were priceless and this picture below sums it all up! While a lot of work did go into this event, it can be recreated in a range of budgets. You can make your own booths and games if you have enough time to plan or rent some of the games and a dunk tank from your local party rental company. As I previously mentioned, the dollar store and Oriental Trading are great sources for prizes and decorations. 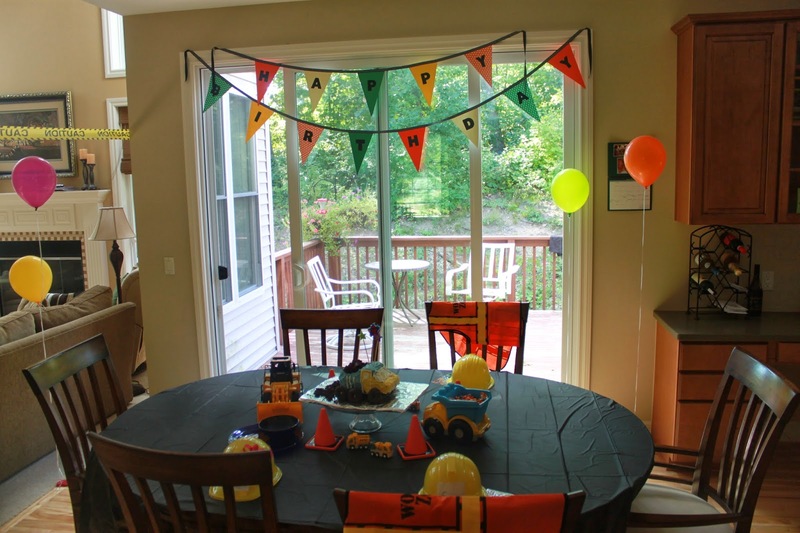 Lastly, just make sure to add lots of colorful balloons, banners, lollipops, and cute little party guests! !